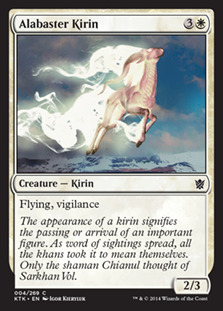 Flavor Text: The appearance of a kirin signifies the passing or arrival of an important figure. As word of sightings spread, all the khans took it to mean themselves. Only the shaman Chianul thought of Sarkhan Vol. We do not currently have any combos that utilize Alabaster Kirin. If you have your own Alabaster Kirin combo, we would greatly appreciate it if you would consider Adding Your Combo to our site. We do not currently have any decks that use Alabaster Kirin. If you have your own deck that has Alabaster Kirin in it, we would greatly appreciate it if you would consider Adding Your Deck to our site. 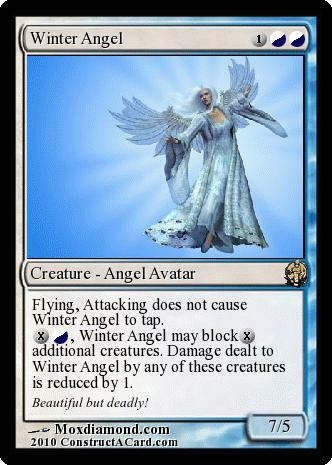 Alabaster Kirin was originally printed, and so far only exists in the Khans of Tarkir magic the gathering set.